The 100 Interview: Isaiah Washington Teases "Jaha is in Possession of the Bigger Gun"
Jaha left his people behind and went on a quest in the search of the City of Light. As The 100 Season 3 begins, he claims to know all about the City of Light after coming in contact with ALIE. This summer, Isaiah Washington shed some light on Jaha's journey this season. 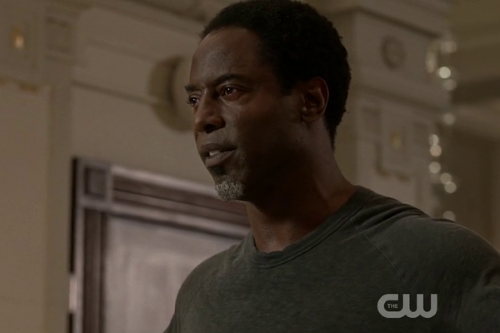 What's going on with Jaha in Season 3? Washington: Jaha is in possession of the bigger gun. He's no longer Chancellor, but he has a lady in a red dress and they have-- or he has a nuclear warhead. Will he be using it for good or for evil? Washington: Jaha is in the possession of the bigger gun and he has access to the lady in red, artificial intelligence, you figure it out. You know his mindset is a little different. He threw someone off a boat. And the only reason Murphy survives is because he can row. Jaha's bottom line has become extremely chilling. What about his spiritual journey? Washington: That's what I'm thinking is so fun about Jaha right now. The juxtapose of what happens when someone is so ensconced in their beliefs that they are willing to threaten and kill and sacrifice other human lives. We are talking about the history of man. What happened when someone goes, "Sometimes you gotta do the wrong thing to do the right thing." How do you get out that rabbit hole? The 100 airs Thursdays at 9 pm ET on the CW.